In this quick dinner recipe, the delicious garlicky-mustardy mayo that tops baked salmon is very versatile. Make extra to use as a dip for fries or to jazz up tuna salad. Precooked brown rice helps get this healthy dinner on the table fast, but if you have other leftover whole grains, such as quinoa or farro, they work well here too. Preheat oven to 425°F. Line a rimmed baking sheet with foil or parchment paper. Brush salmon with 1 tablespoon oil and place on the prepared baking sheet. Mash garlic and salt into a paste with the side of a chef’s knife or a fork. Combine a scant 1 teaspoon of the garlic paste in a small bowl with mayonnaise, mustard and ¼ teaspoon pepper. Spread the mixture on top of the fish. Roast the salmon until it flakes easily with a fork in the thickest part, 6 to 8 minutes per inch of thickness. Meanwhile, heat the remaining 2 tablespoons oil in a large skillet over medium-high heat. Add green beans, lemon zest, pine nuts, the remaining garlic paste and ¼ teaspoon pepper; cook, stirring, until the beans are just tender, 2 to 4 minutes. Reduce heat to medium. Add rice and water and cook, stirring, until hot, 2 to 3 minutes more. 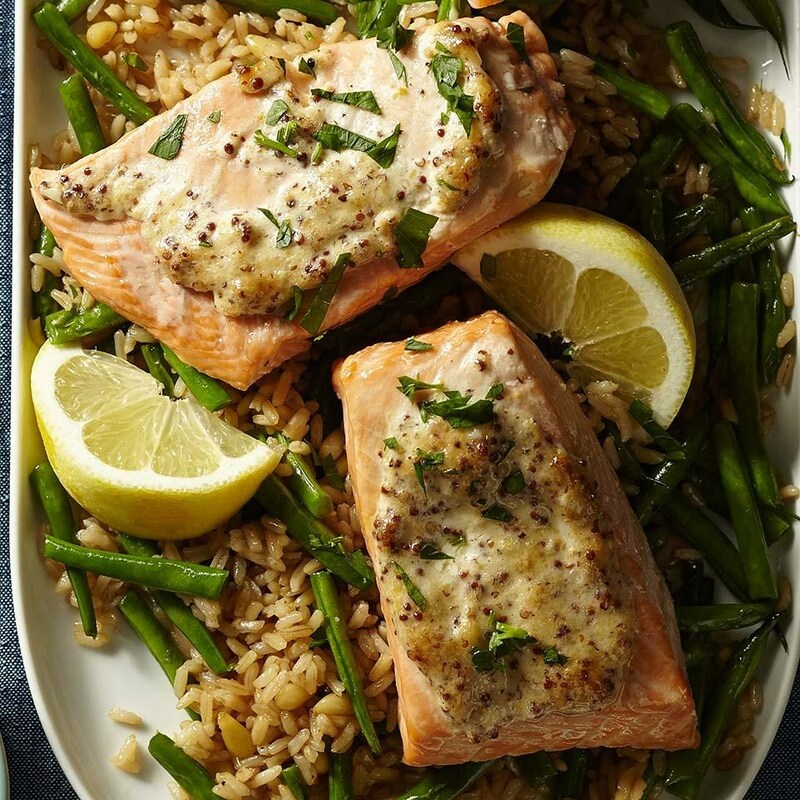 Sprinkle the salmon with parsley, if desired, and serve with the green bean pilaf and lemon wedges. All wild salmon—and now some farmed—is considered a sustainable choice. For farmed, ask for fish that’s raised in land- or tank-based systems. For more information about sustainable seafood, go to seafoodwatch.org.